A panel of Chicago-area residents who wrote chapters in the book Out of Chaos: Hidden Children Remember the Holocaust will speak at the Sunday, Oct. 26, 2014, meeting of the Jewish Genealogical Society of Illinois. The presentation, led by JGSI member Walter Reed, who was a hidden child and contributed a chapter in the book, will begin at 2 p.m. at Temple Beth-El, 3610 Dundee Rd., Northbrook, Ill.
Polish-born Ida Kersz of Skokie and her twin brother, Adam Paluch of Mundelein, will relate their years-long search for each other; and Sheila Gerber, of Wilmette and born in Kaunas, Lithuania, will tell her discovery that her “father” was really her uncle. Each will relate how being hidden and saved meant that they had to re-create their past and search for family members after the Holocaust. The authors will answer questions after the presentation. 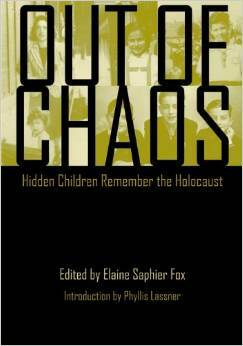 Out of Chaos: Hidden Children Remember the Holocaust, published by Northwestern University Press, is a compilation of the gripping personal survival stories of 24 Chicago-area residents, all members of the Hidden Children of Chicago organization. The JGSI meeting facilities at Temple Beth-El will open at 12:30 p.m. to accommodate members who want to use or borrow genealogy library materials, get help with genealogy websites or ask genealogical questions before the main program begins. For more information, visit http://jgsi.org/ or phone 312-666-0100.